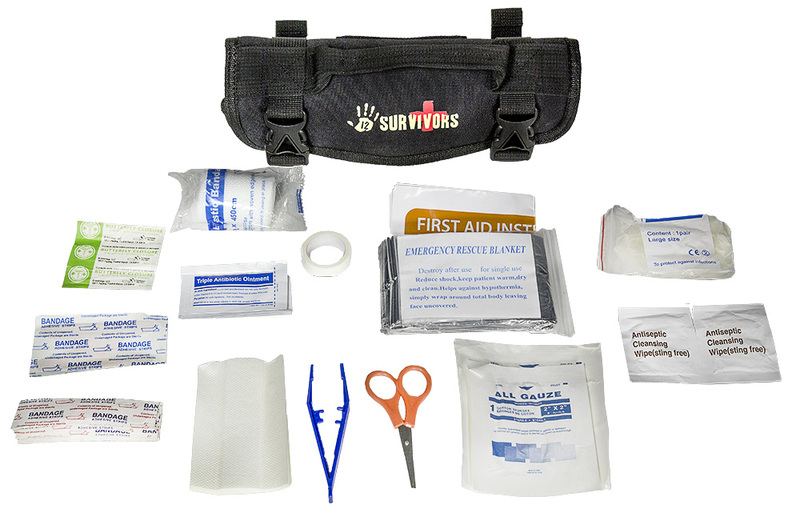 The 12 Survivors Mini First Aid Rollup Kit is an 80-piece survival kit that includes all of your basic first aid needs. This kit is easily packable in a backpack for camping or hiking and can also be stored in a vehicle in case of emergencies. The seven interior zippered compartments keep all items separated and organized for easy use. This reliable kit rolls up and features Velcro and buckle closures with MOLLE straps and a carrying handle to take anywhere. 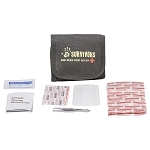 The Mini First Aid Rollup Kit includes: 20 – 1” x 3” (25x75mm) adhesive bandages, 20 – 1.5” x 4” (4x10cm) adhesive bandages, 1 – 2.4” x 4” (6x10cm) nonwoven bandage, 3 – knuckle bandages, 5 – butterfly bandages, 2 – 2” x 2” (5x5cm) dressing gauze, 2 – 3” x 3” (7.5x7.5cm) dressing gauze, 1 – 2” x 39” (5x100cm) dressing gauze roll, 1 – 2” x 177” (5x450cm) elastic bandage, 10 – 2.4” x 3.5” (6x9cm) antiseptic wipes, 1 – 4” (10cm) pair of tweezers, 1 – 0.5” x 177” (1.25x450cm) adhesive tape, 1 - 51” x 82” (130x210cm) emergency blanket, 1 – medical manual, and 1 – mini rollup bag.